Transparency Market Research (TMR) has published a new report titled, “Neonatal Intensive Care Respiratory Devices Market - Global Industry Analysis, Size, Share, Growth, Trends, and Forecast, 2018–2026”. According to the report, the global neonatal intensive care respiratory devices market was valued at US$ 1,500 Mn in 2017 and is projected to expand at a CAGR of 5% from 2018 to 2026. High incidence rate of respiratory diseases in newborn babies and increase in incidence of preterm births and corresponding efforts to improve survival rates are anticipated to boost the growth of the global market from 2018 to 2026. However, demand for neonatal intensive care respiratory devices is anticipated to decline during the forecast period owing to high cost and technical errors in NICU devices. 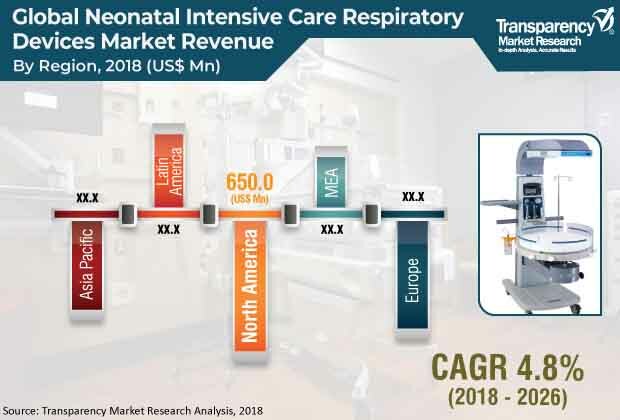 However, surge in government investment in health care infrastructure and strategic alliances among players to penetrate the emerging markets are expected to propel the global neonatal intensive care respiratory devices market during the forecast period. For instance, in October 2018, Handi-Craft Company acquired Infant-Driven Feeding LLC, a neonatal education company focused on improving oral feeding for premature and sick infants. Moreover, Vyaire Medical, Inc. (BD) acquired ACUTRONIC USA, Inc. in April 2018 and Lifelines Neurodiagnostic Systems, Inc. acquired Incereb Ltd. in October 2018. The ventilators segment accounted for the largest share of the global neonatal intensive care respiratory devices market in 2017, owing to high cost of devices, need of neonatal breathing support in NICU, and increase in investment and development of new advanced ventilators by key players. The continuous positive airway pressure devices segment is anticipated to expand at the fastest CAGR during the forecast period due to increase in demand for the devices in NICUs to increase air pressure in patient’s throat to prevent collapse of airway. Moreover, continuous positive airway pressure devices are cheaper than other breathing support devices. The NICU hospitals segment held the largest share of the global neonatal intensive care respiratory devices market in 2017. Rise in awareness about advantages of NICU hospitals such as availability of advanced devices, all levels of treatment for neonates, and trained staff boost the growth of the segment. Infrastructural expansion in NICU hospitals such as increase in the number of beds also drives demand for NICU respiratory devices. In February 2018, Penn State Children's Hospitals, a U.S.-based NICU and PICU specialty hospital, announced plans to expand both NICU and PICU facilities by adding three floors to its existing building and is expected to complete by 2020. North America held major share of the global NICU respiratory devices market in 2017, supported by high cost of technologically advanced respiratory devices and rise in prevalence of premature births. Government initiatives to spread awareness about neonatal diseases and increase in R&D activities augment the market in the region. Moreover, high prices of products, rapid adoption of new devices, and increase in incidence of premature births in the U.S. propel the neonatal intensive care respiratory devices market in North America. A report published by the WHO in 2016 stated that the U.S. ranked sixth in the world in premature births. According to data released by the FDA in 2016, nearly 6% of 4 million births in the U.S. each year requires NICU admission and majority of them is due to preterm birth. Key companies operating in the global neonatal intensive care respiratory devices market and profiled in the report include Getinge AB, Vyaire Medical, Inc. (BD), GE Healthcare, Teleflex Incorporated, Drägerwerk AG & Co. KGaA, Medtronic plc, Mercury Medical, Inspiration Healthcare Group plc, and Trudell Medical International.